Post #68: Fallen Idols? Not even close. Out of nowhere a couple days ago I found out that one of my favorite rock bands, the criminally underrated and barely known Canadian quartet Sloan, were making a stop at Higher Ground here in Burlington and last night I drove over and caught the show. There’s something utterly bizarre about knowing a band’s music for a substantial amount of time before you see them live. It’s almost hard at first to accept that this band that you’ve only known through photos and pop hooks and long drives through Pennsylvania is actually composed of four flesh and blood men who wear t-shirts and tennis shoes. Who adjust guitar straps between songs, sweat after a while, and sip water from generic bottles. At first you feel like you’ve wandered into some dream in your past, a basement party or a long ago conversation, a scrap of high school kicking down the windy streets in your mind. But no, it’s real. Just another rock and roll show. My first thought when I arrived at the show was embarrassment and sadness for Sloan. The place was dead. Not sparsely populated. Dead. I did the math, then texted my wife at home: there are 18 people here I wrote. She wrote back: hahahahaha. At the show’s peak, there were maybe twenty-five people in a room that holds probably four hundred. I hadn’t expected a packed house, but I hadn’t expected a morgue either. Who knows if it was poorly promoted or the band just isn’t known in these parts. Or maybe it was just a Thursday in October. But Sloan, though they seemed a bit bummed by the sheer lack of audience, and quipped about it before plunging into their set, gamely put on a terrific rock show. They were promoting a special edition vinyl re-release of their 1994 opus Twice Removed and the first set consisted of the album in its entirety, followed by a second set full of choice B-Sides and some of their biggest hits. I was in heaven. The band sounded great. Robust and energetic, tight and well rehearsed, yet loose and playful. All the great things we love about rock music. Not too serious music played seriously by professionals doing what they do, bringing the same abilities to their craft whether for a thousand listeners or for twenty. They looked good, too. They’ve been around a while and I wondered if they’d look a bit sad, as aging rockers can. But they didn’t. All were thin and youthful and looked healthy and vibrant. 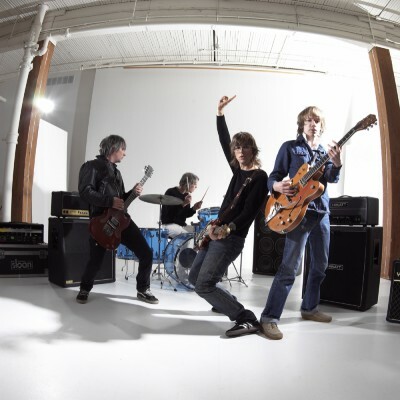 I first discovered Sloan through my older brother, Jacob, who passed along their album One Chord to Another, still my personal favorite, and I’ve been a fan ever sense, secretly enjoying their music and wondering why no one else ever seemed to know who they were. I haven’t always kept up with purchasing their new albums, but I’ve stayed aware of them, wandering occasionally through their catalog on iTunes to see what they were up to, popping into their website from time to time, or catching random YouTube interviews with the band. But so infrequently do I meet another Sloan lover that when confronted by one, as I occasionally am, and was last night, I feel an instant kinship, as if reunited with an old war buddy with whom I can swap stories that we alone will understand because you just have to have been there. When a band lasts a long time, but never makes it huge, the tendency is to feel bad for them. We tend to weigh success in volume. And when a band like Sloan can’t draw a decent crowd in a music town like Burlington that’s not too far from their own home base (originally from Halifax, they all now live in Toronto), it would be easy to wonder why they still bother. Or how they cope with never having blasted into the rock stratosphere, which means that they still have to endure tiny crowds in already small rooms. But there’s other ways to look at it. How about the victory of lasting so long with your original membership? Of continuing to put out new music every couple years, and music that stays consistent, the newest selections holding up against anything in their catalog? I spent the set break talking to Sloan’s merch guy, Jay, and before buying my two sons Sloan t-shirts (and one for myself) I asked him about the crowd. What he told me was that in Canada, the band remains a radio stalwart and very popular, as they always have been, but in the States it’s still, and always has been, hit or miss. In the larger markets (Philly, Boston, New York), he said, Sloan brings out several hundred on a given night, but in smaller market towns–and here he politely swept his arm over the handful of people in attendance–it was usually a small collection of die hards. I was struck, though, by Jay’s energy, by his joy in working for Sloan, by how unapologetic and unworried he seemed by the small crowd, because, hey, it was just one night, and suddenly I felt bad for pitying Sloan. They’ve been around forever, consistently playing music, so they must make money, at least enough to keep doing what they love. Any they sounded good. Better than good. They blew me away with their song craft and musicianship. What is success anyway? To celebrate the band’s recent twentieth anniversary, during which they’ve released an astonishing ten albums of original material, NPR featured a story about Sloan. It’s a nice piece and offers some perspective on the victory of longevity and the benefits of being a band that’s always flown a bit under the radar and why that might have been the only possible path between there and here.